The NEM Initiative is working on a proposal for a focused research and innovation programme – a Public Private Partnership within Horizon 2020 programme – on Immersive & Interactive Content – I2C. It aims at delivering solutions, architectures, technologies and standards for the immersive and interactive environment, responding to and anticipating emerging user needs and leading to improved productivity and collaboration between many sectors of society. The challenge for the I2C-PPP is to strengthen Europe’s leadership in its strongest competency areas and promote advanced innovation where there is a potential for creating new markets such as smart cities, entertainment and media, e-health, education, intelligent transport, and many other areas potentially benefiting from more intuitive and natural interaction with the content. It will foster an open collaborative and innovation platform exploiting all available capabilities and expertise available in Europe for pursuing new challenges and common future goals of maintaining and strengthening the technological lead in advanced media technologies and interactive content. 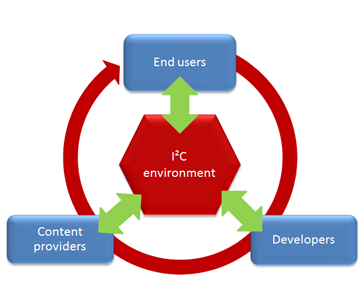 Ope n APIs in the I2C environment connected to delivery networks will allow anyone to develop advanced applications and services such as virtual and augmented reality, enhanced aggregation of various types of content, content analytics etc. Join us to establish the I2C PPP and to drive the future of digital experience! I2C PPP flyer for download.